Rick Tetzeli’s article compares the unsuccessful approach of the billions expended by big pharma to the more modest ($2.5 million annually) but highly successful approach of Wyoming’s not-for-profit Brain Chemistry Labs. Led by Harvard-trained ethnobotanist Dr. Paul Alan Cox, research by five lab scientists and a 50-scientist international consortium, has highlighted the potential of the dietary amino acid L-serine as a means of slowing protein misfolding characteristic of Alzheimer's, ALS, and other progressive neurodegenerative diseases. “How extraordinarily unlikely and yet wonderful would it be if Cox and his colleagues were right—and the best prevention for some of these terrifying diseases turns out to be a naturally occurring protein building block rather than a high-priced drug?” Fortune opines. Pharmaceutical firms have focused on the amyloid hypothesis, the idea that fragments of the amyloid protein in the brain cause Alzheimer's disease. A smaller group of scientists believe that tangles of the protein tau instead trigger Alzheimer's. The Wyoming scientists argue that amyloid and tau are symptoms rather than causes of the disease and instead seek cures in the mechanisms of protein misfolding. The Fortunearticle highlights ethnobotanical research in island villages where Alzheimer's and ALS are frequent versus villages where these diseases are unknown. Massive cyanobacterial blooms associated with the emergency release of nutrient-laden Lake Okeechobee water down the St. Lucie river in the summer of 2016 exposed Florida residents to a potent toxin called microcystin which is known to cause liver cancer. 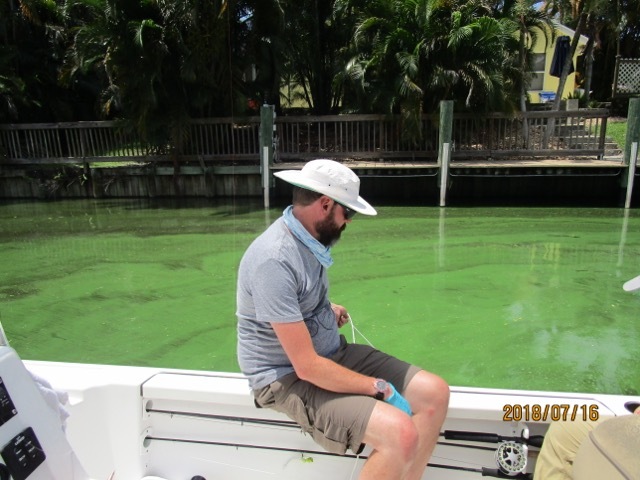 Dr James Metcalf samples from a cyanobacterial bloom in Florida in July, 2018. "It is a reasonable prediction that the cohort of Florida State citizens exposed to the 2016 Florida cyanobacteria bloom incident . . . may experience an increased lifetime risk of liver cancer and/or hepatic dysfunction requiring hospitalization or trans-plantation," cyanobacterial expert Dr. James Metcalf and his colleagues report in a paper published today in the British journal Water Policy. The malodorous 2016 cyanobacterial blooms, referred to as "guacamole" by some residents, were associated with fish kills and the deaths of 11 manatees in the St. Lucie River and Stuart area, but insufficient warning was provided to citizens about potential human health impacts the paper claims. "Neither the State of Florida, nor the U.S. government, currently has water quality criteria or alert levels for cyanotoxins, such as microcystin," Dr. Metcalf and his colleagues find. "We collected cyanobacterial samples from the area as part of our ongoing research into possible links between neurodegenerative illness and cyanobacterial toxins and were relieved to find only very low amounts of the neurotoxin we are studying ," Dr. Paul Alan Cox, Executive Director of the Brain Chemistry Labs said. "However, when we analyzed the samples in our laboratory for microcystin, we were stunned to find that the concentrations of microcystin were 10,000 times greater than that allowed by the state of Ohio for recreational waters." Cyanobacterial blooms associated with Lake Okeechobee are a recurring problem in Florida. Metcalf and other researchers from the Brain Chemistry Labs, a not-for-profit research center in Jackson Hole, Wyoming, are once again collecting samples from the current cyanobacterial blooms on the east and west coasts of Florida. Marilyn Asay, telephone: 801 375 6214, marilyn@ethnomedicine.org.